Red Fife is one of Canada's oldest varieties of wheat; legend has it originating in the Ukraine, or Turkey. According to Wikipedia, it originated in Turkey and then made its way to the Ukraine, where it was grown by Mennonites. My Red Fife came from an organic family farm in Sortheastern Alberta, where it has been grown for at least 100 years. My love affair with this ancient grain began a year ago, when my daughter brought me a chunk of Red Fife sourdough from a local artisan bakery I hadn't known about. The sourdough, in a word, was AWESOME. It was love at first bite. I keep my grains in food grade containers purchased from local shops. 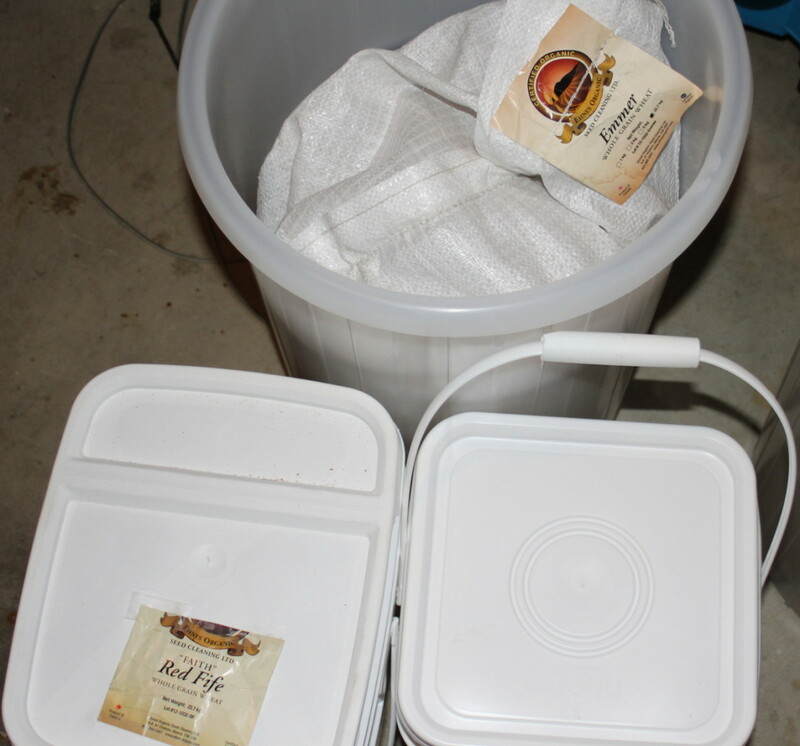 The type of container designed for making wine is just right for storing 50-pound bags of grain, in this case, Emmer, from Ehnes Farms. 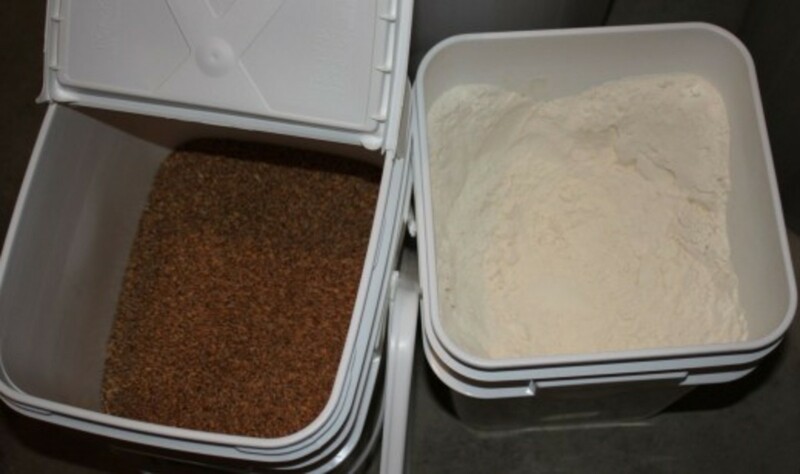 Here are two of the containers I use to store open flours and grains. I prefer the one on the left for its hinged lid, and use the type on the right for my generic modern flours. I found these at a local plastics shop, but they should be widely available. 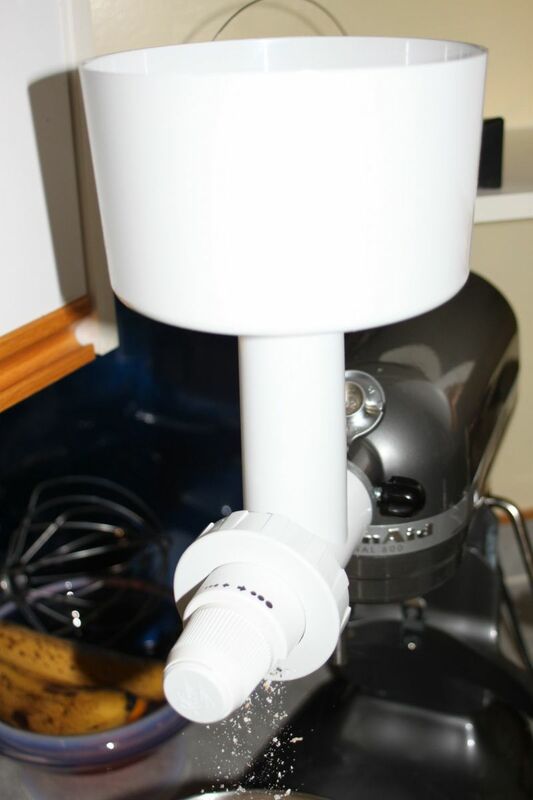 I love my KitchenAid 600 - I bought it to mill my grain, but also use it to mix large batches of dough - the dough hook does a great job! 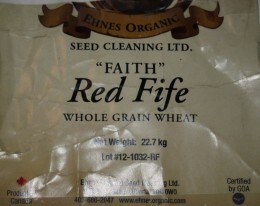 My quest for Red Fife began at Ehnes Farm. 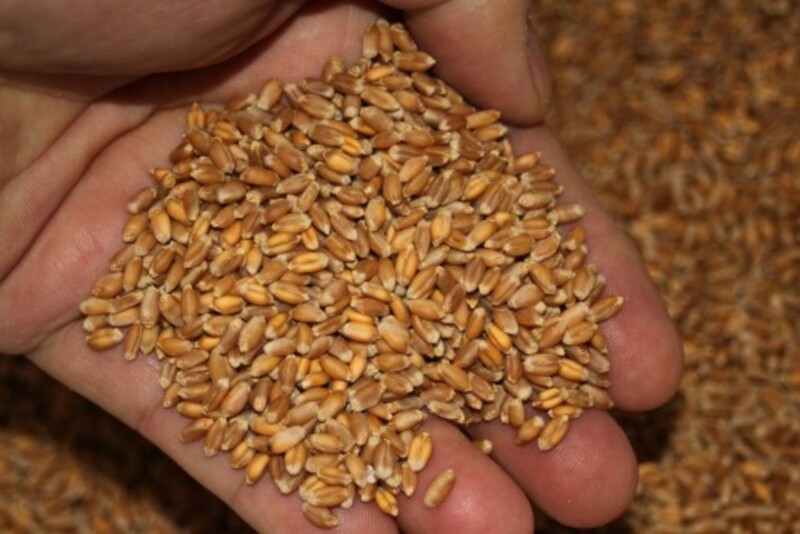 The proprietor, Bernie Ehnes, was really knowledgible when it came to heritage wheat, and so he should be -- his family has been farming here since they homesteaded the land way back in 1911. Bernie ships his ancient grains all over North America, and I'm certain he'd be delighted to ship it to you, too. You'll find contact information on his website (and a link to it at the bottom of this page). Because I wanted to have the flexibility to produce any type of flour I wanted on demand, I decided to do it myself. The photo above shows the coarseness of my cracked wheat. I use a half cup of cracked Red Fife for my artisan sourdough because I love the texture it adds to the bread. You can see the coarseness of the grind in the photo above. 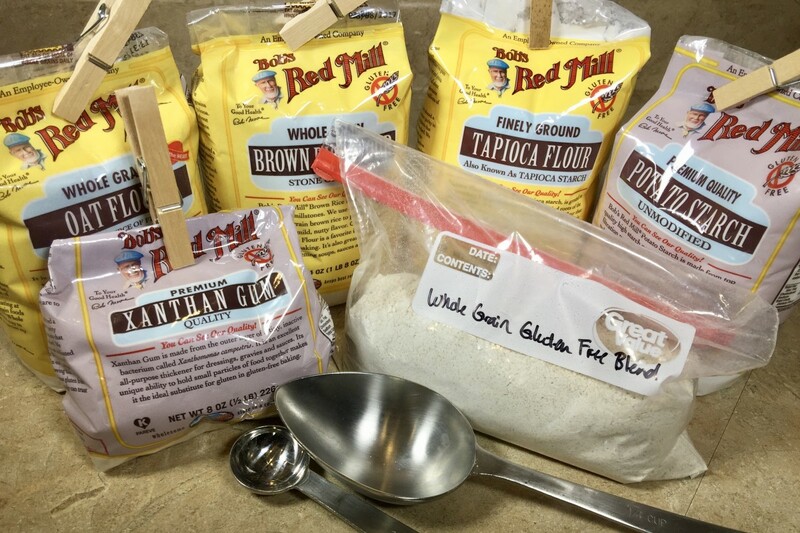 This flour was milled using the Family Grain Mill's finest setting. 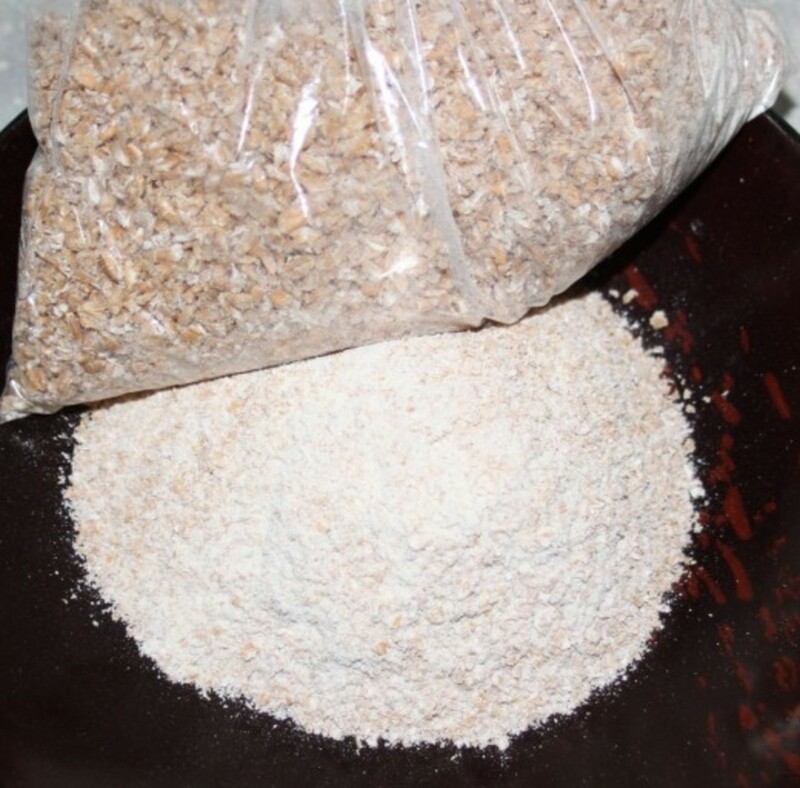 I use it in my sourdough recipe as well as the cracked wheat. The difference between the two grinds is apparent. 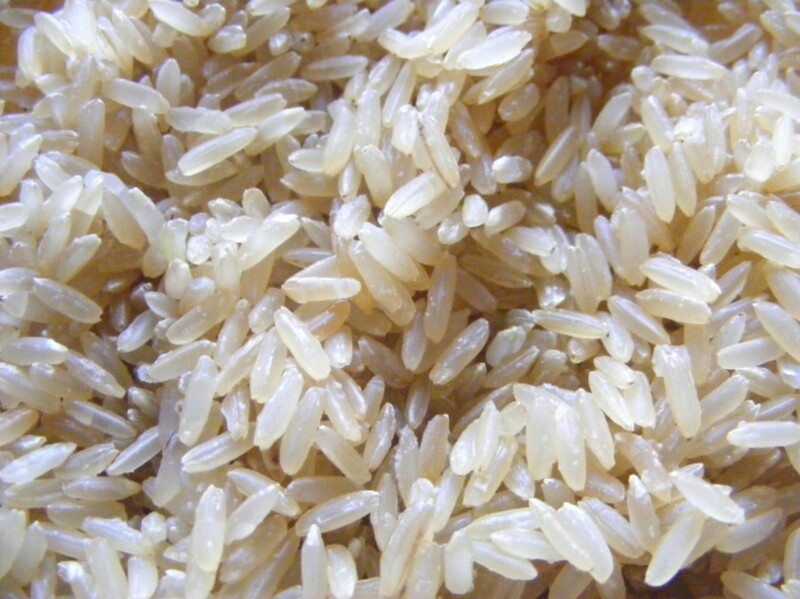 The cracked wheat's also great as a breakfast cereal, or soaked in water for 24 hours and served as a vegetable. There are endless variations of this recipe and process. 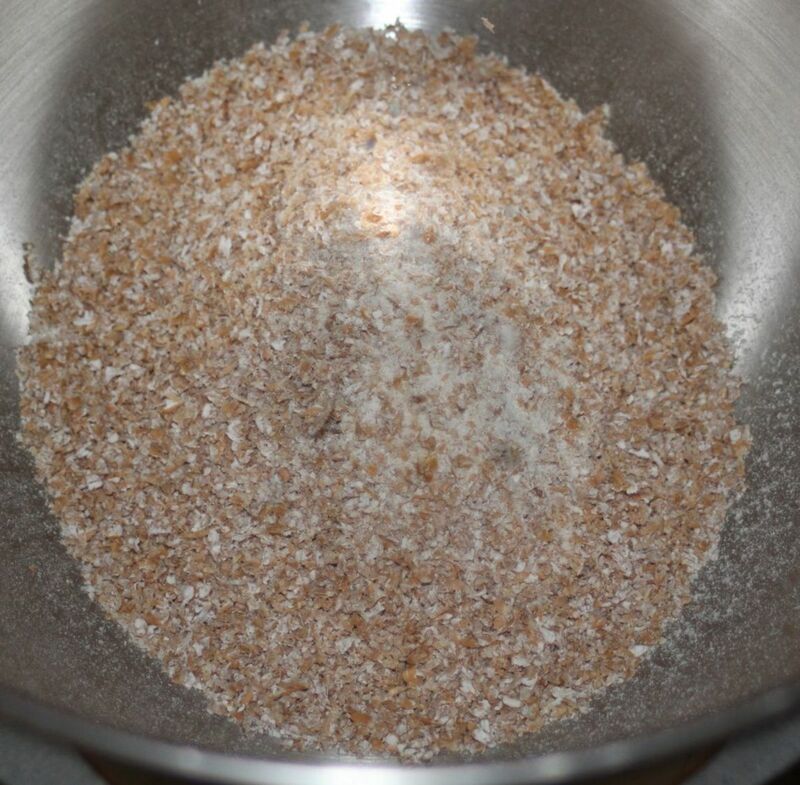 Purists may prefer using 3 cups of Red Fife and skipping the Cracked Wheat and Chia - I do it all the time, but find the dough easier to work with if I add a bit of white flour. I'd love to hear from anyone who bakes this bread - sharing experiences is half the fun. 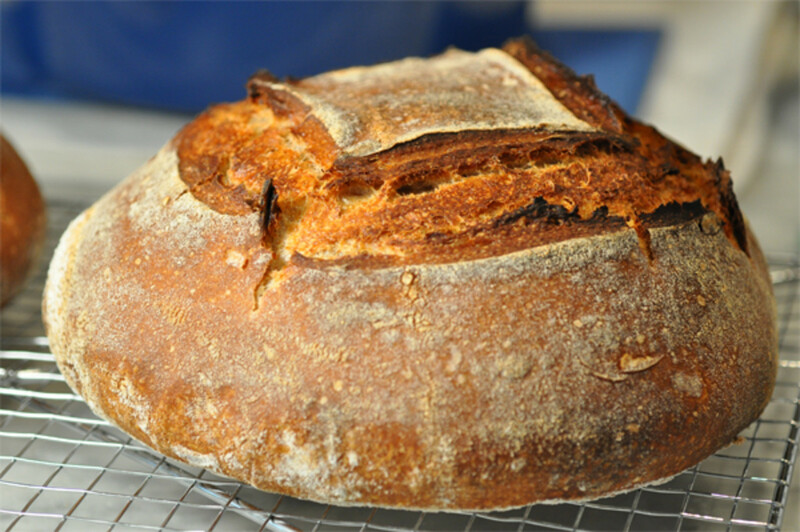 This recipe yields about 1.8 pounds of awesome sourdough. Mix the dry ingredients together in a large bowl. I prefer using my KitchenAid bowl for this, but any bowl will do. (You will also need a second bowl for proofing the dough - more on this later.) Add the water after the salt has dissolved and mix thoroughly, then add the active sourdough culture. If the mixture is too dry, add small amounts of water until the dough can form a cohesive ball. If the dough is too wet, and is difficult to handle, add small amounts of flour until you can form that ball. Prepare a second bowl that's about 4 times larger than your ball of dough by coating it lightly with olive oil. Place the dough in this bowl and roll it over so the top has a light coating of oil, then cover the dough with plastic wrap. This will keep the crust of the dough from drying out during the proofing process. 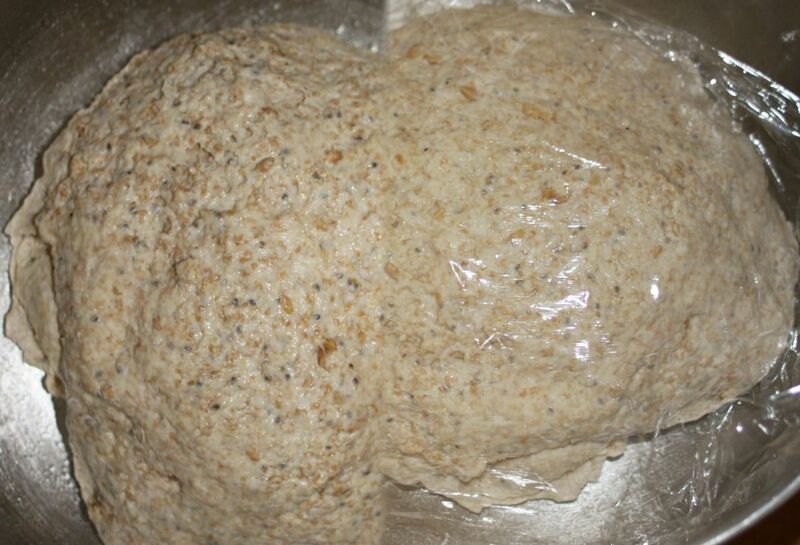 Let the dough proof ("rise") for 17 or 18 hours, then remove the plastic wrap and throw it away. Place the Lodge Dutch Oven in your oven and pre-heat to 475 degrees Fahrenheit. Dump the dough out onto a floured cutting board - I use my Epicurean Kitchen Series 15-Inch-by-11-Inch for this - it's the perfect size. 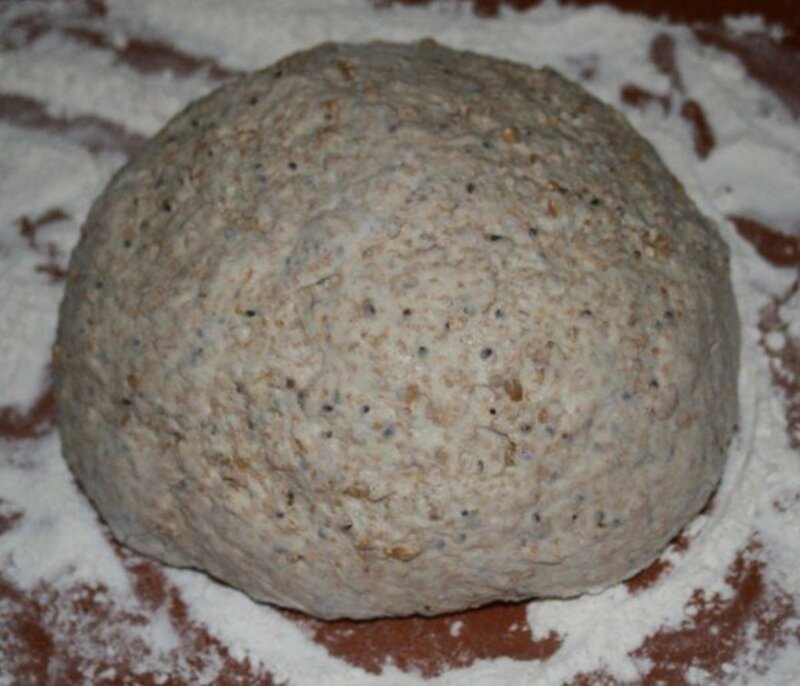 Gently flour and fold the dough a few times until you can form a round loaf - do not knead the dough. When the oven reaches 475 degrees, remove the Dutch Oven (carefully - it's HOT) and place it on a stove burner or other safe place and remove the lid. 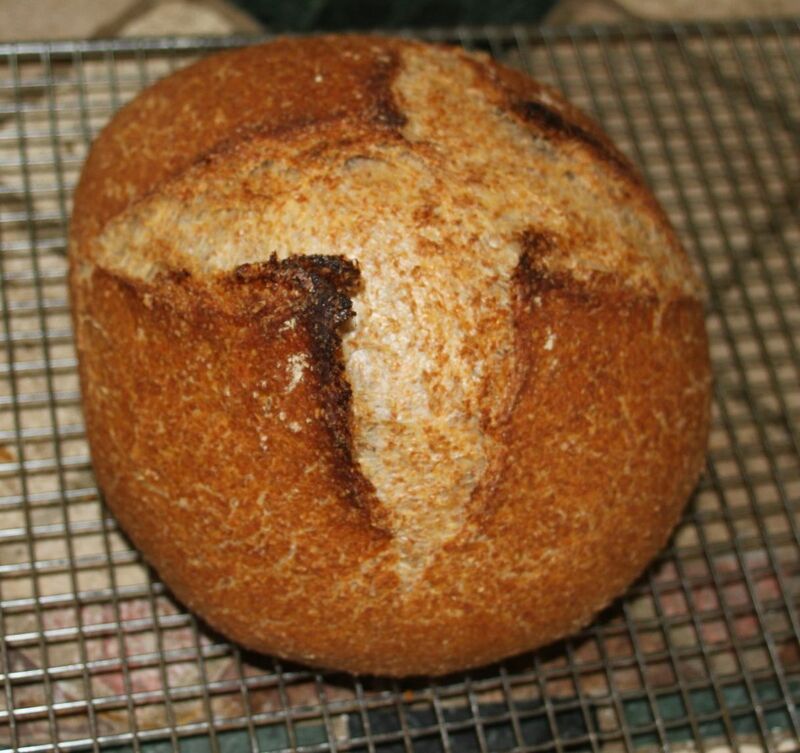 Carefully place the sourdough in the Dutch Oven, replace the lid, and return it to the oven. The Dutch Oven will retain moisture from the dough and steam it, producing a lovely, thick, chewy crust. Bake for 30 minutes, remove the lid, and bake another 15 minutes to brown the crust. Remove the bread and place it on a grill to cool. Resist the temptation of cut the loaf - let it cool for at least 30 minutes. The Lodge Dutch Oven - My Secret Weapon - This is the perfect vehicle for creating artisan sourdoughs. I consider several things essential when it comes to my baking. One is my enameled cast iron pizza pan, another is my 12" pizza stone, and another this marvelous Dutch Oven. The oven is mentioned in the recipe; although you can certainly bake sourdough without it (I did for years), the Lodge consistently produces a thick, chewy sourdough crust without which it just isn't sourdough. UPDATE: I now use a Sassafras Stoneware Baker for my sourdoughs, but still love the Lodge! This merged photo shows the dough after being moved to the oiled bowl. The left half of the photo shows the raw dough - you can clearly see the cracked wheat and Chia. On the right side of the photo, you can see the dough after covering with plastic wrap. After proofing for about 17 hours (at room temperature), the dough nearly fills the bowl. It can now be removed, punched down and shaped. Ready For The (Dutch) Oven! Red Fife Sourdough, Ready for the oven. The dough has been punched down and shaped, and is now ready for baking in the Dutch Oven. The Chia seeds and Cracked Wheat catch your eye right away. 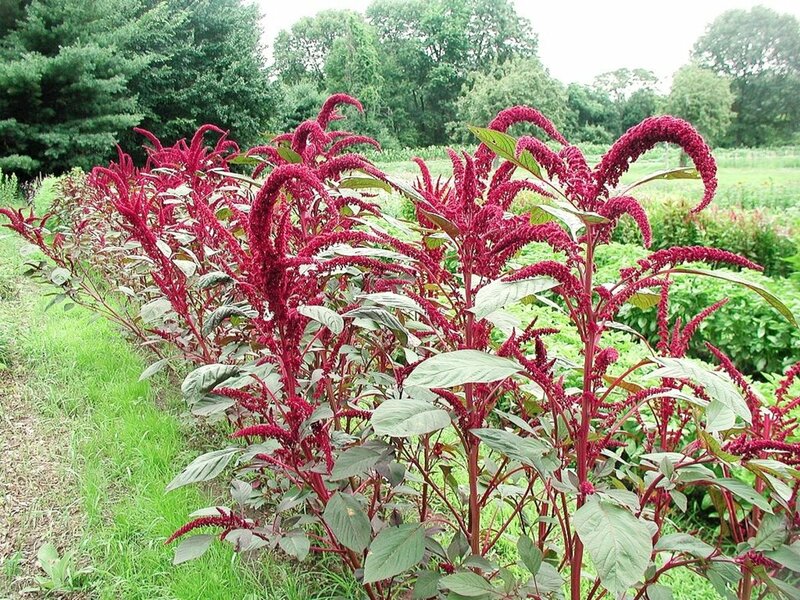 "By the 1860s Red Fife was distributed and grown across Canada." This is where I found my Messerschmidt Family Grain Mill. This is another great source for ancient grains, located on Vancouver Island and in Summerland in the Interior of British Columbia. Ed & Jean Wood's incredible sourdough site - this is where I obtain my exotic cultures. "The seed might have originated in Turkey, then moved across the Black Sea to the Ukraine.."
Artisan Red Fife Sourdough - Just Out Of The Oven! This is the sourdough produced to build this lens - My daughter - the one who introduced me to Red Fife Sourdough in the first place - was the lucky recipient. 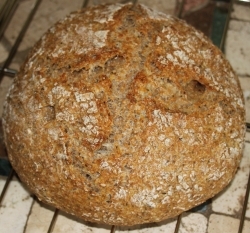 This was my very first loaf of Red Fife - it was awesome. Having grown up in Sourdough Central (the San Francisco Bay area), I fell in love with tangy sourdoughs long before most of you were born. Later in life, this led me to start baking my own, and I've now been at it for more than twenty years. It would be nice to know how many sourdough fans there are "out there," which is why I added this brief poll. Love Sourdough? - Take a moment and say hello! Just received my red fife wheat berries, and sourdough starter. Made white sourdough bread for years so now I want to try red fife wheat....with my new starter from breadtopia. I have used olive oil in the past, to put off dryness, but no longer do. I love the chewy texture (and spent more than a few bucks on Dutch Ovens and stoneware bakers just to enhance it). Hi. Lovely article, lots of interesting pictures. I used to make sourdough myself but have never milled my own flour. I know for purists this is a no no; but have you ever tried adding a very small amount of fat to your dough? Just a small knob, about 1/2 oz. It softens the texture and is less 'chewy' but still delicious. Try it and see what you think. Could I substitute emmer instead of the white flour? I want to stay away from any flour other than heritage. 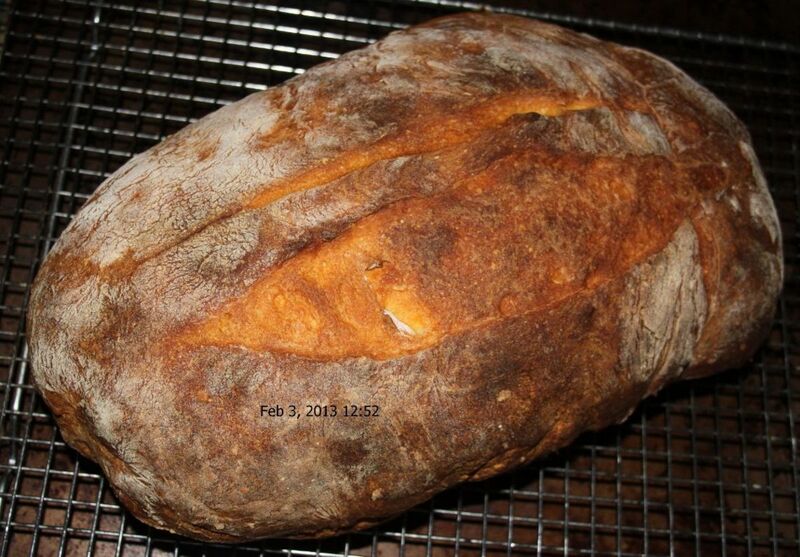 @ecogranny: I use Ed Woods' San Francisco sourdough culture, which I've kept for more than ten years. Ed sells exotic cultures from all over the world at his Sourdoughs International site. 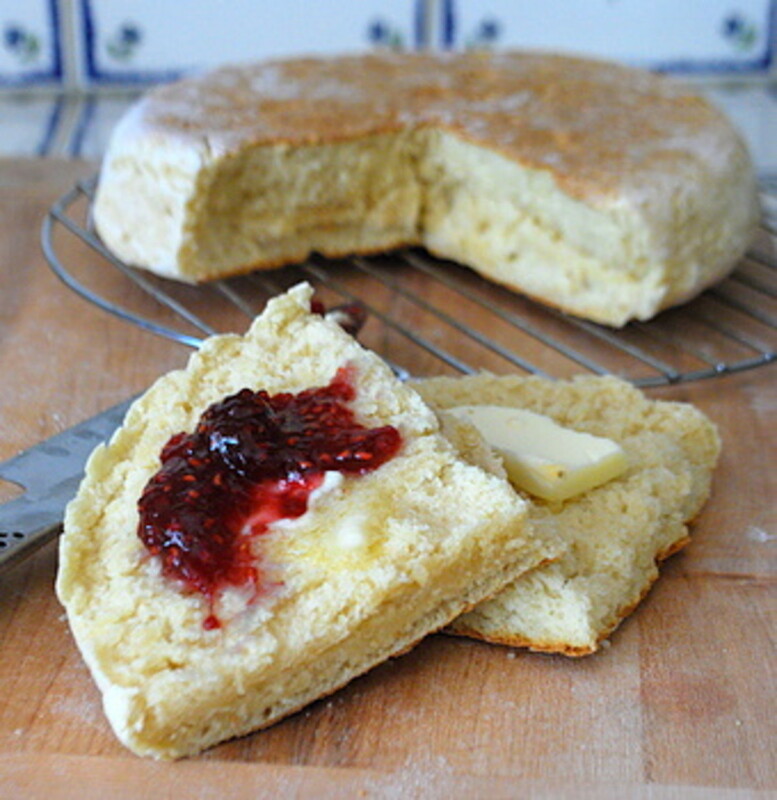 I have captured local cultures in the past - it's a great way to start baking with sourdough. I do indeed, and I have to try your recipe. 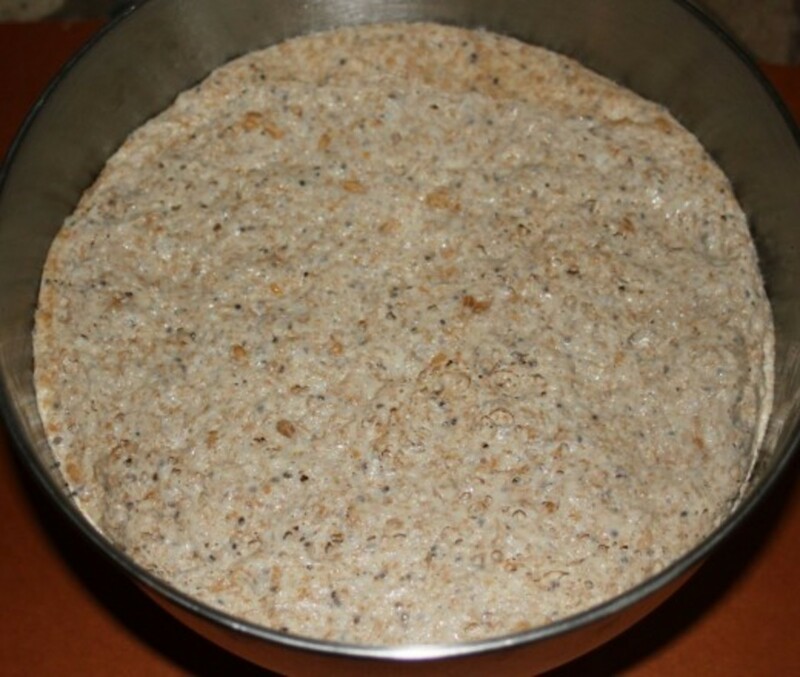 Do you cultivate your own sourdough starter from wild yeast? Or do you use a commercial starter? Thanks for the recipe, as well as for the information about the wheat. I love that the wheat you use has been in the Fife family for so many generations. I will pin this and also post it to my Facebook page titled "Cooking with whole grains &amp; whole foods." Looks yummy! I make my bread for many years n ow and I could never switch back to supermarket products! Congs on your LOTD. Great lens. @Jhale Moreno: Glad you found the page useful. You don't need anything fancy to make sourdough - and it's worth the effort. Congratulations on your LOTD, totally awesome lens, great pictures, and bread looks so yummy! I have never gotten to try real sourdough yet, but I am very thankful for your article which provides information about mills and wheat resources that I may have missed without you. Thank you! That is absolutely mouth-watering. I like the way you have used the text with big picture module throughout. Congratulations on LotD, it's well-deserved. Congratulations on your LotD award. The bread looks heavenly.Thanks for sharing. Congrats on LOTD, you have made me hungry now staring at that freshly baked loaf! Very interesting, great read, and is challenging. 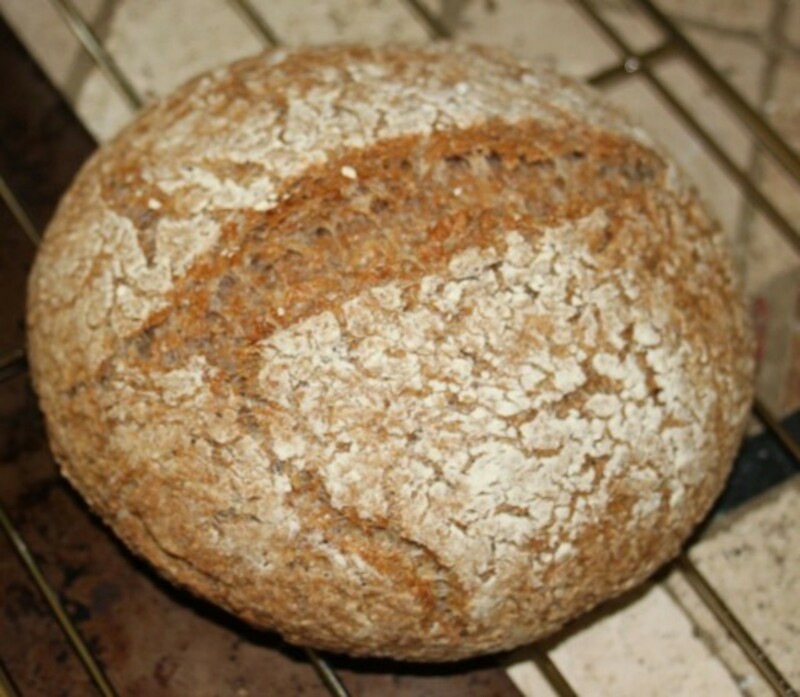 Sour dough is a really easy way to make bread and healthier than using yeast. One of my interests on retirement is artisan baking and heirloom recipes, fruits and vegetables. Thanks for this information and congrasts on LOTD. @Northerntrials: Sourdough culture contains a symbiotic pairing of wild yeast and lactobacteria. I do not use commercial yeast, and do not believe it would be possible to produce this bread while doing so. How I proof the dough depends entirely on the result desired. My usual practice is to proof the dough at room temperature for 2-3 hours, and then retard for 15 to 20 hours in a 41 degree fridge. 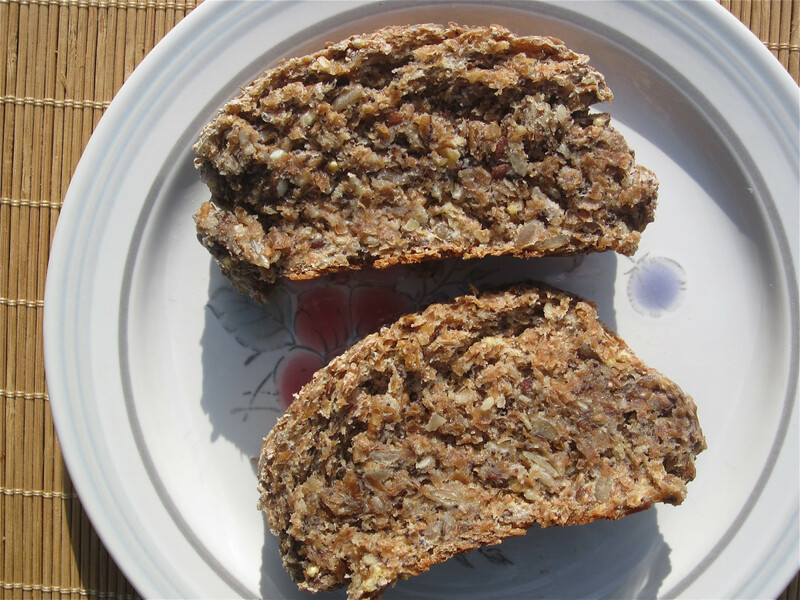 With Red Fife, there is no need to retard the dough - it produces very sour bread without retardation. Great looking recipe. Congratulations on getting LotD! Some would argue that this is not real sourdough because you use yeast and not sourdough starter, but I agree with you that the long slow rise you put the dough through builds the sourdough taste. Do you let the dough rise on the counter or in the fridge? When I have a sourdough starter going I still do the slow rise in the fridge overnight. Yummy! I LOVE fresh baked bread. Yours looks so delicious. I haven't had the luck of using sourdough. I'm probably a little to antsy to wait 17 hours to proof. Congrats on LOTD! Wow, this is something for the weekend! Love bread in all it's different varieties. Yum! Oh I'm drooling! I've never used a dutch oven to make bread. Outstanding! THat looks fantastic. Thanks for the lens. 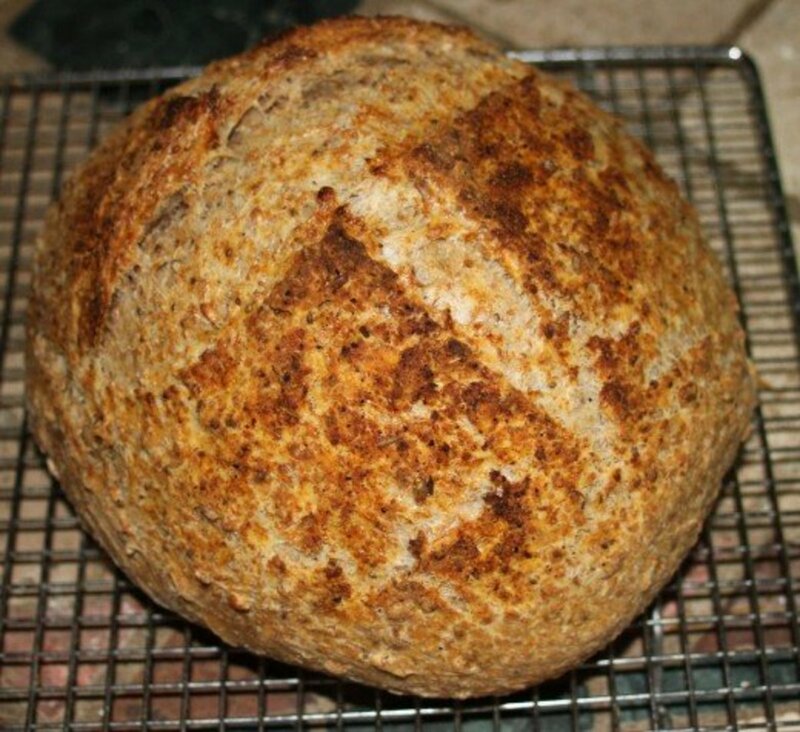 @jknake lm: That lovely Dutch Oven is perfect for yeast breads (trust me). Check out Jim Lahey's method. I'm drooling....seriously...I make my own bread and am experimenting with ancient grains (after reading "Wheat Belly") I've used the Einkorn flour and have the berries to grind myself. Thank you, and congratulations! Wonderful lens, we should all appreciate the recipes that are brought to us through antiquity. Thanks! Oh My Gosh! That looks sssooooo good! I wonder if you could bake other breads in the dutch oven? My husband doesn't care for the sourdough but I like it. I just love crunchy, chewy breads. Thanks for the lens, it's beautiful. I can almost smell the bread from this picture! Love it. It's lunch time, so I think I'll have some now. Thanks. @anonymous: I do maintain my own culture, and have done for more than ten years. You will find an awesome selection of sourdough cultures at Ed Wood's site, SOURDO.COM. I use his San Francisco culture. Yes, I love sourdough, and your loaves look very tasty! What a wonderful lens!! 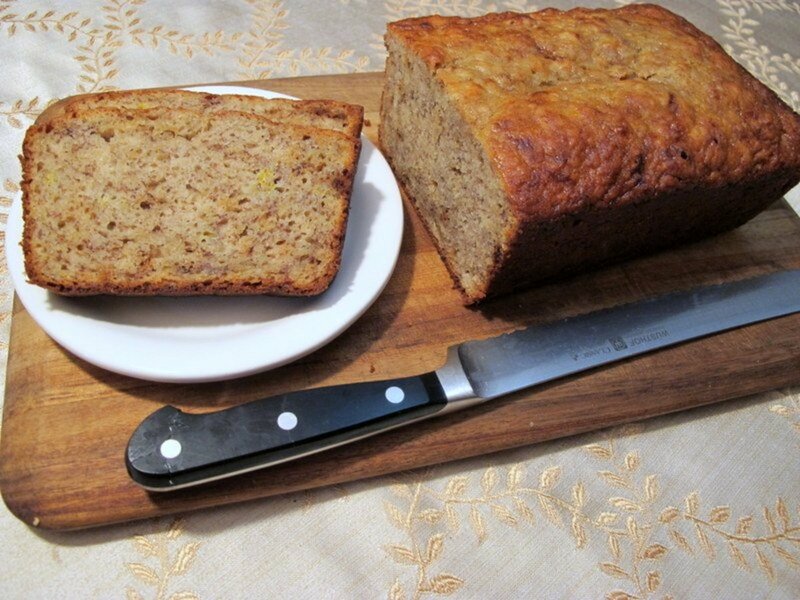 Thanks so much for sharing your recipe, photos and links. Looks fabulous! I appreciate the info about the dutch oven and grain mill. When time permits I will be referring back to this lens - I do love baking fresh bread! hello, looks yummy! did you grow your own sourdough? Looks and sounds wonderful! I do love sourdough, but sad to say I'm on a diet, but will pinned your recipe as I want to try making this. A true work of art. I would consider this sourdough a gift of happiness. Excellent presentation. Congrats on Lens of the Day! 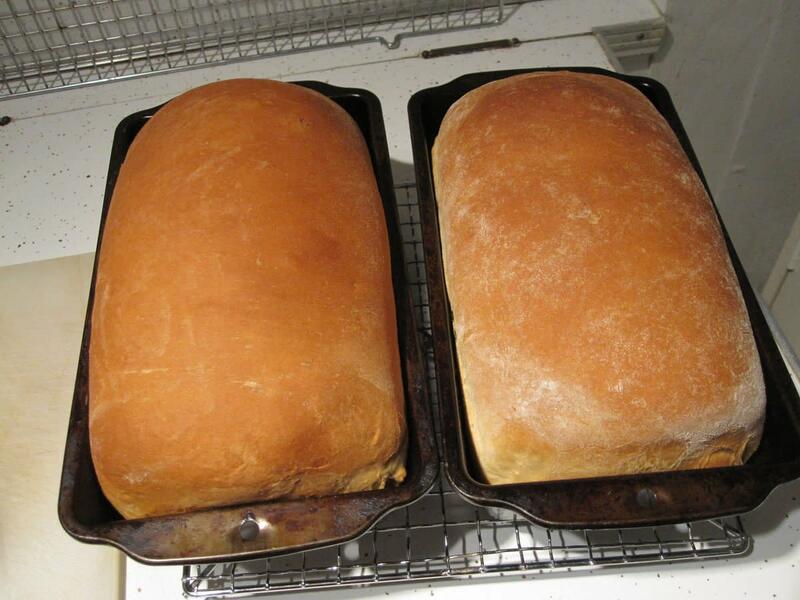 We used to bake our own bread from flour we bought in the store. But mill my own flour? ... Great idea! Very informative lens,I reckon that you spent a lot of thinking and preparing to come with a very good lens. Making your own bread always feels and tastes a lot better.